Voddie is one of my favorite writers. He explains the Bible with such clarity and tenderness towards Jesus. I enjoyed The Ever-Loving Truth and Family Driven Faith immensely. 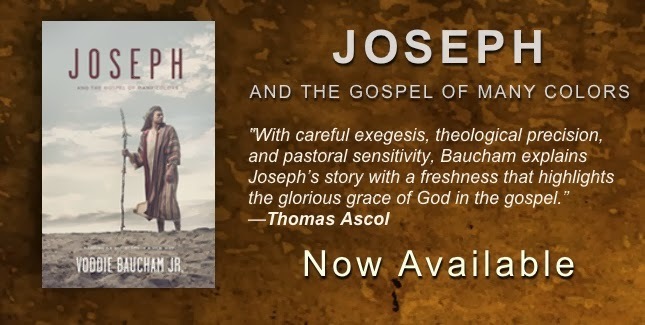 This telling of the life of Joseph was no different. Someone explaining that the story of Joseph was not some moral tale for us to emulate was like life to dry bones. The story wasn't about Joseph at all. It's a beautiful tale of redemption and the far reaching lengths that God goes to in order to rescue us. He sent Joseph on a horrible journey to ensure that the life of a scoundrel could be saved and redeemed. He did that so that we might have the Promised seed of Christ. One thing that stood out to me was how Voddie points out that the most beautiful work of God here is the fact that Joseph is not bitter. He never corrects his brothers. He only points back to trusting in God's sovereignty. That is a work of grace. Get Voddie's book. I started praying through Family Shepherds for Denbigh. Stay tuned.